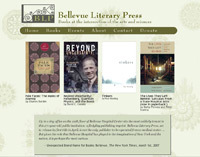 Bellevue Literary Press approached me, desiring to upgrade the look and feel of their site, make it more professional, and be easier for customers to find books of interest. I developed wireframes as well as a new structure and layout, and designed the first visual design iteration. While a designer improved upon the visuals, the improved structure and easily editable new codebase continues to serve the BLP well.